Some mysterious black rings have appeared in the sky across the world, causing quite a stir among the many people who have sighted it. People around the world have been left baffled by menacing black rings appearing in the sky, sparking theories they could be alien portals. The bizarre black ring-shaped UFOs, which can be hundreds of feet wide, have been dubbed ‘smoke vortexes’. 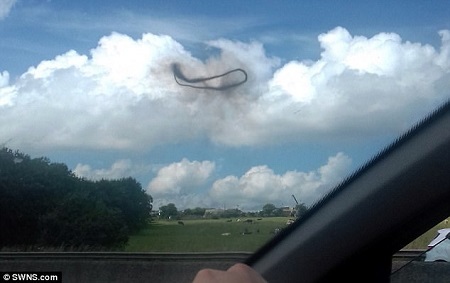 The most recent strange ‘smoke vortex’ was spotted above the M62 near Birkenshaw in Yorkshire. Last year a black ring was spotted above Disneyland in California and in 2015 eerie footage emerged of a 320 feet-wide (100 metre-wide) ring of smoke floating over clear skies in Kazakhstan. But one expert has revealed the latest black ring was simply the byproduct of cannon fire of a battle reenactment at the nearby Yorkshire Wartime Event. 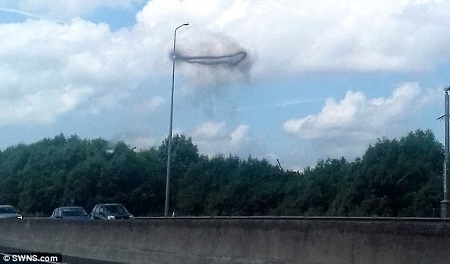 The ‘smoke vortex’ was spotted above the M62 near Birkenshaw in Yorkshire last weekend. Kimberley Robinson spotted it while in the car with her roofer boyfriend Danny Cooper, 26, when she looked up and saw a mysterious black ring. The 22-year-old photographed the black mark on her Samsung phone. ‘Smoke rings in the sky like this one look very spooky and unusual’, Nigel Watson, author of ‘UFOs of the first World War’ told MailOnline. The Yorkshire Wartime Event taking place nearby involved more than 500 Military Vehicles and 50 reenactments. Canon fire can creates these smoke rings because it produces a sudden disturbance in the surrounding air, and as a result, creates a circular vortex. The air is displaced around the ring while the air within the vortex circles within the ring. Similar smoke rings have been formed at music festivals such as Burning Man. Nick Pope, who used to investigate UFOs and other mysteries for the Ministry of Defence, also debunked the phenomenon. He said: ‘Despite exotic theories about UFOs, aliens, or portals to other dimensions, I believe there’s a decidedly down-to-earth explanation here. ‘A so-called smoke vortex can arise when you have a blast through a circular structure like a smokestack. ‘So these weird effects can be caused by accident – or indeed by design. While there appears to be a simple explanation, Miss Robinson was baffled by the ring. She described the circle as ‘the weirdest thing I have ever seen’. A spokesperson for the Met Office said: ‘We have had a look at it and cannot think of anything metrological that would have caused such a phenomenon. ‘It looks reasonably clear, with fair-weather cloud that looks like it has bubbled up. There is a little bit of rising air in the atmosphere’, he said. ‘It does not appear to be anything at ground level that is causing the smoke to rise. On 27 April 2016 a video showed the bizarre cloud-like phenomena hovering above the Magic Castle at the popular theme park in California. Baffled visitors watched it float by, yelling: ‘What is that?’ while a conspiracy theorist said it would cause families to worry of an alien invasion. In the footage witnesses were heard exclaiming in shock as the mysterious ring floated above them. The film maker, Kyle Hawkins, said: ‘No idea what this could be… Walking up main Street at Disneyland, following the parade. ‘It was a windy night, couldn’t have been a smoke ring. ‘Everyone watched it in fear/confusion. I half expected an alien portal to open up through this ring as we were gazing up in disbelief…The strangest thing I’ve ever seen. In 2015 eerie footage emerged of a 100 metre-wide (320 feet-wide) black ring of smoke floating over clear skies in Kazakhstan. It was seen 40 miles north of the capital Astana and hovered in the sky for 15 minutes before suddenly vanishing without trace. In 2014 one was spotted above Warwick and stayed in the sky for three minutes. It was believed to be smoke from the pyrotechnics used at Warwick castle.